The Devon is a cat with a very people oriented disposition. They love to be with you, and to ‘help’ you do all sorts of activities, from reading to cleaning the house. If you are seated, you will generally have a Devon in your lap. If you are standing, you may have one on your shoulder, if you are lying down, you will generally have one keeping you company. 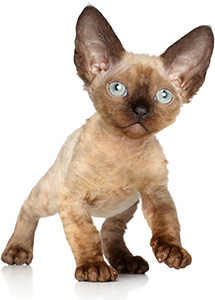 The two most striking features of Devon Rex are their curly coats and their pixie faces. Many people describe a Devon Rex as looking like Yoda from “Star Wars” or one of the Gremlins from the movies of that name. Their coats sometimes are described as looking like a Persian lamb coat, but also may look more like the tousled curls of Little Orphan Annie. Devons are medium framed cats, with the males averaging 8-10 lbs. and the females 5-8 lbs. They are moderately active and quiet voiced. They tend to have hearty appetites, and some can tend to put on too much weight if given unlimited food. Devons are very easy to care for. Their wavy coats shed little, and when bathed dry quickly. Their large ears do seem to attract a bit more dirt than that of other breeds, so a weekly cleaning with a cotton ball is helpful. Many Devons learn tricks! Lots of them will fetch toys and are so obsessive about the game that you will tire before they do. Many like to jump from the floor to your shoulder and ride there. Interested in getting a Devon Rex kitten? Read our guide on buying a pedigreed kitten from a reputable breeder or then look for a breeder on Planet Devon! For a more detailed look at Devon characteristics see Anita White’s drawings.